Use DeoxIT DN5 on new or restored electrical contacts to condition them against future corrosion. 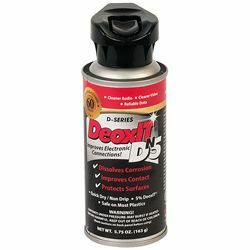 DeoxIT DN5 dissolves oxidation and corrosion on metal surfaces, fills in microscopic gaps and reseals surfaces for better electrical conductivity. The DeoxIT DN5 spray nozzle includes a foldable straw for less mess and easy storage. Please note, ground shipping only.